The Rebel Sweetheart. : Spotlight | SkinFood Sugar Cookie Blusher in Bebe Pink. Spotlight | SkinFood Sugar Cookie Blusher in Bebe Pink. The past few days have been hot as hell and unbelievably humid. Times like these, I wear makeup to a minimum and keep my face as bare as possible. Doing my makeup routine in this kind of heat is already painstaking, what more if I wear full makeup under the scorching hot summer sun? And so for the time being, I decided to keep my 'warm' blushers at bay (you know how fond I am of my Sleek Makeup Blush in Pomegranate and Tony Moly's Cheek Tint in Cherry Pink) and use something 'cool' instead. Case in point, the SkinFood Sugar Cookie Blusher which was sent to me by my husband about six months ago. 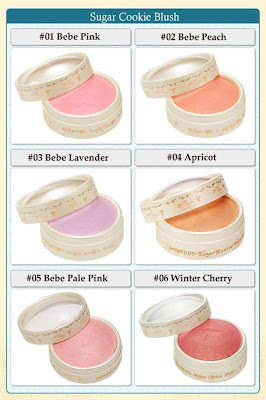 I first saw this product in the SkinFood website, where it's described as a "specially oven-baked blusher with cute and lovely colors infused with pearl creates radiant, lustrous, and vibrant-looking cheeks". They're awfully cute alright, which is the main reason why I asked the husband to get this for me. I can't remember if it was my choice or his, but I ended up with Blusher #01 aka Bebe Pink. It's priced at 7000 Korean Won, which is about more or less Php 260 (or about US$5) when converted. The SkinFood Sugar Cookie Blusher comes in a little cardboard compact. Screw the cap off, and ta-da! You get a domed, baked blusher in a lovely shade of pink. Flip it over and you'll see the product description. In Hangul. Now here's how the product looks like when swatched on the skin. Bebe Pink has very fine shimmers in it. Not chunky or glittery, just good enough to give your cheeks a nice glow and make your face appear bright and dewy. It's a bit difficult to work with this blusher, though. I tried using a regular blush brush at first, but the color just wouldn't come out. Switching to a mini kabuki, I somehow managed to pack the brush with color and apply it on my skin. Yes, the color is sheer. Maybe too sheer for some, but I'm really liking the pink glow this blusher does for my cheeks. It makes my face glisten like an innocent teenager, hahaha! My husband is totally digging this look, too. Perhaps because he bought the blusher? Lol. - Has a mild, subtly sweet scent. - Dewy effect on the cheeks. - Gives the face a nice, healthy glow. - Affordable price (when bought in Korea, that is). - Color might be too sheer for some. - A bit difficult to work with, if you don't have the right brush. CHEEKS: SkinFood Sugar Cookie Blusher in Bebe Pink. LIPS: Double Hit Lip in Rose Riot. This is a definitely helpful product for this summer. I like sheer blushes that aren't too obvious. I've never seen one in lavender though. I wonder what that looks like! Thank you for sharing about this blush! It gets hot here in the desert, so I'm always looking for light weight makeup and this looks like a great product. Thanks! I actually like my blushes sheer! I'll try and swatch some when I pass by their store. This should give your skin an added glow.